Export Stout. ABV may vary. Fra fat Øst, delt med Ovesen 17.07.18: brunsvart med flott skum som varer helt ned. Overbevisende aroma og smak av røstet malt, nybrente kaffebønner, luksus espresso, sammeen med litt furunål, tjære og lakris. Simpelthen lekker. UPDATED: JUL 17, 2018 From tap at Øst, Stavanger, with JMD 17.07.18. Ebony. Dense and persistent head and lacing. Aroma of roasted barley, cigar box, old sea house, liquorice pine and freshly roasted bitter coffee. Similar taste. 330 ml bottle gifted by Leighton, thanks a lot. Hope to share beers with you again! Tan head, some mild lace in a snifter. The aroma is very roasted with notes of alcohol, wood, and dark chocolate. Flavor mirrors the nose with decent coffee bitterness and a dry texture. Medium to a nearly full body. Overall, very respectable. Bottle from Leighton. Pours black, looks dense in the glass, surprising for a 7.5% ABV. smells of charcoal, chocolate, smoke and coffee. Nice mouthfeel. it’s creamy and smooth. very dense. cocoa and bitter toward the end. solid. Bottle @ home. Cellared for 18 months, Black with a beige medium to large head, good duration. 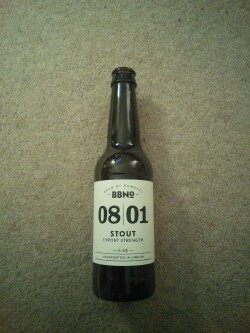 Aroma has a nice dry roasted maltiness, dark fruits, coffee, licorice, hints of vanilla and toffee. Taste is dry, sharply roasted with coffee, red fruits, plums, raisins, oak, bitter chocolate, soy. Bitter bone dry finish with lingering coffee, vanilla hints, oak. Butelka 0,33l. Kolor ciemny, piana znikająca. Aromat gorzkiej czekolady i kakao, w smaku czuć moc, alkohol dobrze ukryty, mocne, dobre piwo. Bottle. Black colour, average beige head with good retention and lacing. Aroma of bitter chocolate, roasted malts, coffee beans, some burnt toffee. Taste is light to medium sweet and medium bitter, lots of bitter chocolate, cocoa, espresso, with a long, roasty bitter finish. Medium body, oily texture, soft carbonation. Good, nicely roasted stout. Aromat - gorzka czekolada, espresso, wiśnie w czekoladzie, lody śmietanowo czekoladowe. Piana - beżowa, średnia, ale drobna; zdobi szkło. Wytrawne, kawowo kakaowe, dużo gorzkiej czekolady i paloności. Delikatnie kawowo kwaśne. Goryczka średnia, długa i nieco zalegająca, palono chmielowa. Alkohol jedynie rozgrzewa przełyk.